Prideaux Castle /ˈprɪdɨks/ is a quadrivallate Iron Age hillfort situated atop a 133 m (435 ft) high conical hill near the southern boundary of the parish of Luxulyan, Cornwall, England, United Kingdom. 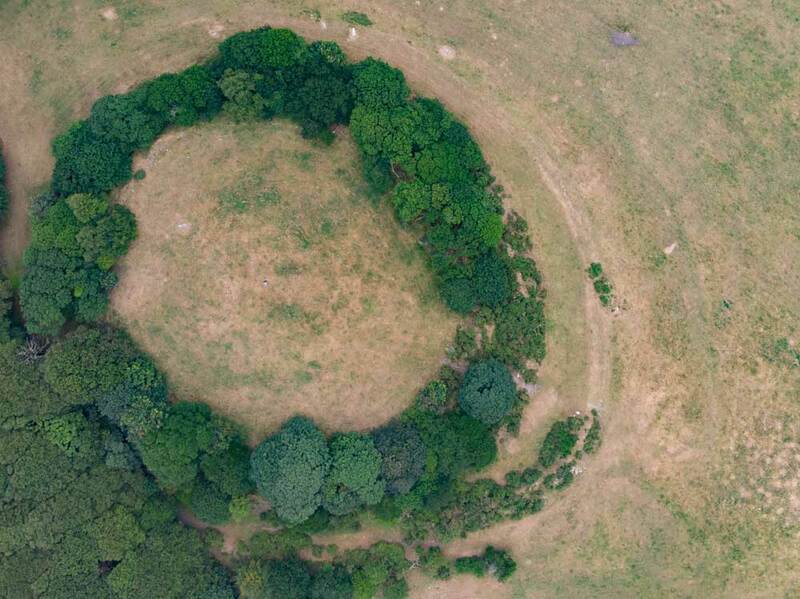 The remains of the first and second circular ramparts are quite distinct, although overgrown with trees on the north and east sides. They appear to be constructed of earth and rubble. The third rampart is only fragmentarily represented, but easily traced, due to the vegetation. A fourth, outermost wall is discerned on aerial photographs, or on the 1888 Ordnance Survey map. This outermost wall is in the form of an incomplete “D” shape, extending to the west and south on the downhill slope of the site. There are two entrances, typical of the small hillfort, located on the eastern and northern side (i.e., opposite the fourth wall), where it is most wooded. There is no evidence of dressed stones. The palisade and any internal structures would have been of wooden construction and must have perished without trace. The earliest occupation in the vicinity of the site dates from the Bronze Age. Cornwall has functioned continuously since high antiquity as a centre of tin mining and trade, tin being an essential ingredient of bronze. The fort is situated not far from the ancient trade route which later became known as the Saints’ Way; from here tin was traded as far as the Levant. The central role of tin mining in the local economy seem to have a continuity leading up to the stannary “Pridias”, which in later times was one of the “tithings” (administrative districts) of the Blackmoor Stannary, centered at nearby Hensbarrow Beacon, with its records stored at the church in Luxulyan. The western branch of the Bronze Age trade route later known as Saint’s Way passes the foot of the hill on which the fort is situated, less than 100 m away on the southwest slope. Local legend would have it that the tin merchant Joseph of Arimathea passed this way with the boy Jesus on his pilgrimage to Glastonbury. A cross in nearby Fowey memorializes this legend. On a clear day looking in an east-southeasterly direction from the fort, it might be possible to see Castle Dore, a somewhat more well-known hillfort situated at a distance of approximately 5 km (3 mi), as the crow flies, mentioned below. Castle Dore has been traditionally assigned to Mark of Cornwall, husband of Iseult, in the Arthurian cycle. There is a monument believed by some to refer to Tristan (“Drustanus”) in nearby Fowey. Photographers notes: Small but perfectly formed Hill Fort. Ditches partly covered by stubby trees so might be better to return in winter to get a better view. This fort is on private land, but if you would like to visit then I can pass your details on to the owners who were very friendly when I visited in Summer 2018. Summary: Possible small contour hillfort or round located at end of prominent SE-facing spur above streams on E flowing into St Austell Bay on S. Steep slopes, moderate along ridge on NW. Roughly circular enclosing c. 0.81ha. Defined by three closely-spaced concentric ramparts and ditches, with incomplete fourth or more likely counterscarp on W. Ramparts range 1.3m to 2.7m, high inner best, outermost as partial scarp to 1.3m high. Possible staggered entrance on W, but no obvious break in third rampart, that on E possibly later. On N and E circuit overlain by field boundaries. Circular depression, 0.5m deep, outside fourth rampart on E side possible round house or small quarry. Chance finds of numerous flints, slingstones, stone axe and sherd of South-West Decorated pottery from interior. Pasture interior, wooded banks and Warren Wood to E and S. On 1st Ed. OS map (1882).